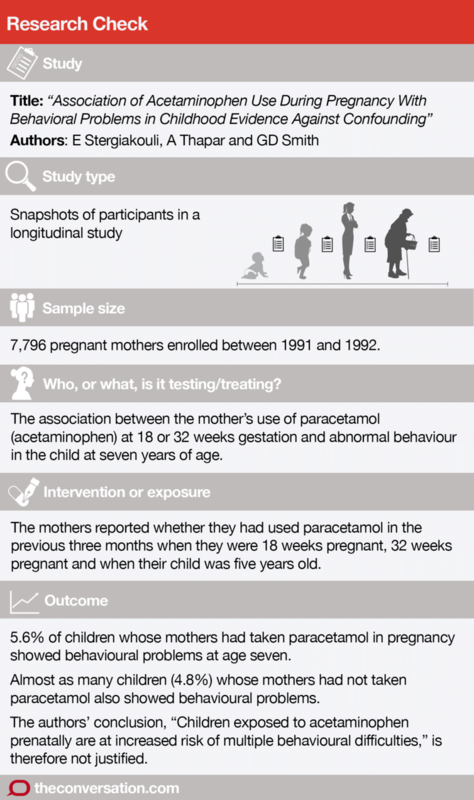 Research Check: does paracetamol in pregnancy cause child behavioural problems? Paracetamol is widely used in all stages of pregnancy to reduce a high temperature and relieve pain. It should be taken only when needed, but is generally considered safe for the baby. A study published on Tuesday in the journal JAMA Pediatrics linked the drug to behavioural problems in childhood, generating alarming headlines such as “Science says taking paracetamol when pregnant can lead to hyperactive children” and “Pregnant women ‘could put babies at risk of developing behavioural problems if they take paracetamol after 18 weeks’ ”. So, are the headlines right? The short answer is no. This paper does not provide any evidence that paracetamol causes childhood behavioural problems. A more practical question is whether pregnant women and their doctors should change their use of paracetamol (also known as acetaminophen in the United States) on the basis of this paper. The answer to this is also no. 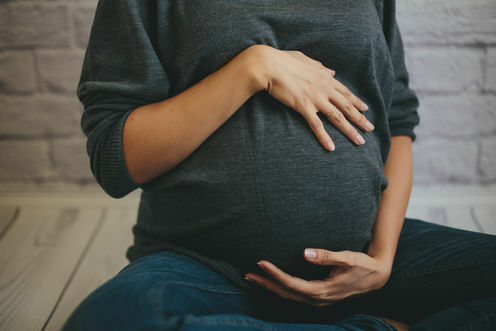 The researchers studied pregnant women who had taken paracetamol during pregnancy and the behaviour of their children at seven years of age. The study tracked 7,796 mothers enrolled between 1991 and 1992 together with their children and partners in the Avon Longitudinal Study of Parents and Children (ALSPAC). At 18 and 32 weeks of pregnancy, the mothers were asked to recall if they had used paracetamol in the preceding three months. The mothers weren’t asked about dose or duration of treatment but were asked to recall the reason for taking paracetamol. These included: muscle and joint problems, infections (including cold or flu, urinary or other infections), migraine or headaches. However, these reasons were not analysed separately in relation to the behavioural outcomes in the children. When the children were 61 months (five years) old, the mothers and their partners were asked the same questions about paracetamol use in the previous three months. prosocial behaviours (“shares well with other children”). Each item is scored as Not True (0/2 points, depending on whether the behaviour is negative or positive), Somewhat True (1 point) or Certainly True (2/0 points). The scores from four of the domains (20 questions excluding the prosocial scale) are then combined to give a single SDQ total of 0-40. Children with scores of 17 and above are deemed to have a behavioural problem. At 18 weeks, 4,415 (53%) mothers and at 32 weeks 3,381 (42%) mothers reported having taken paracetamol. The paper doesn’t say if any mother had taken paracetamol during both periods, or if they had taken any other medications. The authors reported that 5% of the seven-year-olds whose mothers had ingested paracetamol at 18 or 32 weeks exhibited behavioural problems. It’s possible to find associations between all sorts of things. Spending in the US on science, space and technology, for instance, is estimated to have a 99.79% correlation with suicides by hanging, strangulation and suffocation. But this correlation is meaningless. US spending on science doesn’t cause these forms of suicide. Maternal paracetamol use in pregnancy causing behavioural problems in children is a plausible association. But based on this research, it’s not possible to say one causes the other. Proving causation requires an entirely different set of scientific experiments. 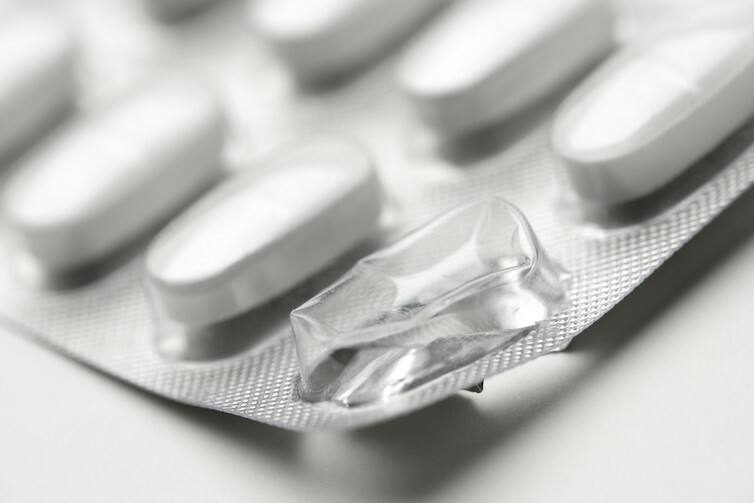 For paracetamol use at 18 weeks' gestation, the total incidence of behavioural difficulties (abnormal SDQ scores) at age seven was 5.6% compared with 4.8% for children whose mothers had not taken paracetamol (eTable 1). At 32 weeks, the figures were 6.3% for the paracetamol group and 4.3% for the non-paracetamol group (eTable 1). For the mothers' use of paracetamol when their child was aged five, the percentages of behavioural problems weren’t much different: 5.3% for the mothers who took paracetamol and 4.1% for the children of mothers who did not take paracetamol (eTable 1). It’s hard to imagine how a mother’s or partner’s paracetamol use when the children were five – and presumably not breastfeeding – could have any effect on their behaviour two years later. The similarity of the percentages at the three reporting points suggests the mothers' paracetamol use in pregnancy was unlikely to be involved in the behavioural problems of the children. Even if it was accepted that paracetamol might be having an effect, only a very small number of children would be affected. At 18 weeks, for example, the difference between children whose mothers had taken paracetamol and those who had not was 0.8%, or one child in 125. The study also has some technical problems, such as discrepancies between figures in the text and tables. All medication is a balance between risks of side-effects and potential benefits. In this case, providing paracetamol is used for a good clinical reason, at the dose specified and for the shortest possible time, the risk is low. This Research Check accurately summarises the key finding of the JAMA Pediatrics paper, and correctly identifies the technical issues that will be of most concern to pregnant women. It also fairly translates the paper into terms that are more understandable to the lay reader. If anything, the Research Check fails to convey the frustration that even experienced researchers would have trying to derive actual numbers of affected children in the control and paracetamol arms. 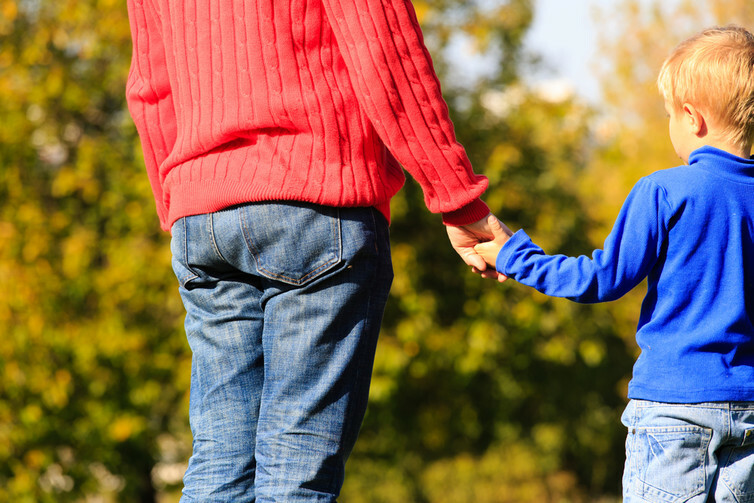 The Research Check correctly states that the actual proportion of children with behavioural issues were very similar between mothers who had never consumed paracetamol and those who did, and that the increased risk was small. One aspect that was not emphasised is the statistics. There is a lot of variation in the data, and some of the behaviours reported as being increased are of marginal significance, especially the 18-week results. The Research Check notes there is no information on the amount of paracetamol ingested and how often. This makes interpreting the risk due to paracetamol even more problematic. The Research Check correctly states that even if there is an effect of paracetamol, it is very small. The relevance of these findings to modern paracetamol usage is also limited. The JAMA Pediatrics study took place in the 1990s in the United Kingdom. In 1998, the UK changed its regulations on pack sizes to reduce accidental and deliberate overdose. This move was successful and women in the UK are now less likely to be exposed to as much paracetamol as they were in the 1990s. Ian Musgrave receives funding from the National Health and Medical Research Council to study adulterants and contaminants of herbal medicines, and has received past funding from the Australian Research Council to study nutracueticals and amyloid toxicity. Mark Habgood and Norman Saunders do not work for, consult, own shares in or receive funding from any company or organisation that would benefit from this article, and has disclosed no relevant affiliations beyond the academic appointment above.